If you have recently purchased forest land, you may be challenged by the task of managing this resource. Forests represent a significant and complex component of our natural environment that constantly changes through natural and human made impacts. A great first step for a woodland manager is to develop a stewardship plan. The best way to start is to walk your land and inventory what is there. Also begin to think about your objectives for your property. Eventually, you can complete a more formal inventory of the land and document it in your plan. You may wish to seek the help of a professional forester or the soil & water conservation district in developing your plan. You may need to modify your goals and objectives to match your land’s natural capabilities. Healthy trees, quality fish and wildlife habitat, and forest products are just a few of the objectives that woodland owners have in mind. Invasive weeds often take up valuable space where healthy, native trees should be growing. See the ‘Weeds’ section for more details on how to control invasive species. As trees grow, they may begin to crowd each other and their growth will slow down. This is a good time to remove a few trees to give the others more space. Insects and diseases can damage the health of your woodland, but professionals are available to help you devise a plan to manage these problems. Wooded streamsides improve water quality and cool water temperatures. They also add cover for animals that travel along stream corridors. Diverse forests with several different species can accommodate the needs of multiple species of wildlife. Dead trees, when they’re not located in a dangerous area, can be wonderful habitat for woodpeckers, flying squirrels, and several other species of wildlife. A healthy forest offers more opportunity for economic return on timber and other forest products. Planting appropriate species on the best soils will help you grow large trees faster. Attend woodland owner meetings and learn more about harvesting and marketing special forest products like mushrooms, floral greens, and other goods. 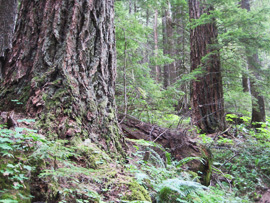 Forest practice rules require tree retention along many streams, wetlands, and lakes. Operators must protect soils, fish and wildlife habitat, and water quality. This website discusses the specific requirements.